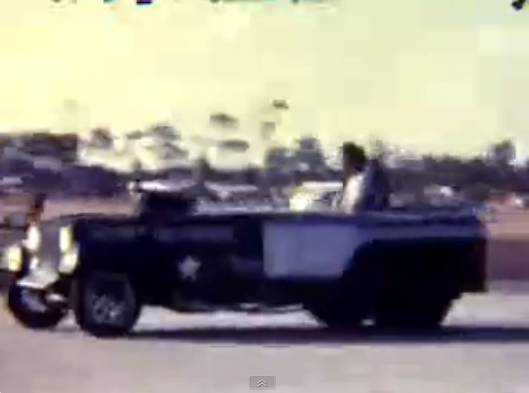 Vintage Drag Video: Sunshine Drag Strip In Florida Circa The Mid-1960s! Wild Altered Corvette, Jeep Funny Car, More! Sunshine Drag Strip opened in 1960, serving the needs of drag racers in the Clearwater, Tampa, and St. Petersburg. The track like most strips has an interesting history that got more dicey in recent years when the state of Florida bought the land the track is on to make a highway ramp, then never got the funding for the project, and now the place is operating again as Showtime Dragstrip on the eighth mile. In this video that was shot sometime in the middle to late 1960s we see all kinds of cool stuff but the real gem in this video is the fleeting footage of Scottie Scott’s “Secret Destroyer” Jeep funny car. The name was a take off on the popular Secret Weapon and Destroyer Jeep funnies terrorizing the west coast at the same time. While the car shared a similar name with those other machines, it did not share their performances. According to the guy we consider to be the leading funny car historian in the world Danny White, Scott’s Jeep at the time of this video was running an injected big block Chevy on fuel. According to what the Jeep looks like and White’s notes on the car, this video was shot in 1968. Powered by an injected big block Chevy engine and managed a career best lap of 8.21 at over 170mph somewhere in this time frame. The track itself is a wondrously neat place. In studying maps of the place on Google you can see that the course was basically created on a dead end city street. Originally run as a quarter mile facility, it is now an eighth mile strip and since it opened in 1960, the shutdown is actually 41st st. Seriously. Look up 41st street in Clearwater, Florida on Google maps and you will find the shutdown of Sunshine Dragstrip. But wait. It gets better. 126th ave North actually CROSSES the drag strip at the finish line! For real. You can see tire tracks of car coming up 126th and driving straight across the course. 126th must be a dirt road because that seems to be what it leaving the “foot prints” on the traction compound treated asphalt. Want to get crazier? The end of the track is a steel gate. Why? Because about 50ft past that is Ulmerton Rd, a busy thoroughfare. When fast cars run, the gate is open and someone apparently monitors traffic to make sure there isn’t complete and utter carnage down there. If you don’t believe us, we’re embedding the map image below the video we want you to watch. Hole in the wall drag strips are the absolute best and embody the spirit of the sport we love so much. Long live Sunshine Drag Strip! PRESS PLAY BELOW TO SEE THE VIDEO AND THEN KEEP SCROLLING DOWN TO CHECK OUT THE GOOGLE MAPS IMAGE OF THE TRACK! That’s Hasley Hood’s home track!